Because we can't resist the opportunity to throw a little shindig, we had a great, yet intimate Mad Men premiere party last night. We started off with martinis, of course, with hand stuffed blue cheese olives. We listened to The Fleetwoods, The Flamingos, The Platters and The Ink Spots, creating the perfect laid-back 1960's vibe. Then we moved on to the real theme of our party; Retro 1960's Polynesian Luau. The martinis were replaced with Mai Tais, and out came the pineapple upside down cake and the amazing pupu platter. 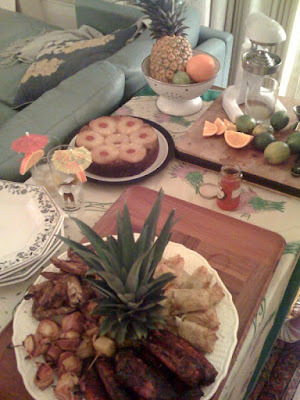 We spent the afternoon making asian/polynesian inspired chicken wings, bbq ribs, egg rolls and bacon-wrapped pineapple. We listened to Hawaii HiFi and The Girl From Ipanema. It was pretty awesome. Pretty, pretty, pretty awesome. Granted I was seeing double by the time the actual episode aired, but seeing two Don Drapers at a time never hurt anybody. We all loved the episode and felt they (literally) started off with a bang, giving us a whole lot to look forward to this season. We may have to throw a crazy 60's themed cocktail party every Sunday. A show this good deserves to be watched with good food, good drinks and good company.